Music has always been really important to my life. I worked for nearly 20 years in the music industry. I wanted to be in a band way before I knew I wanted to be a writer (musical talent was however completely absent). I wrote would-be song lyrics rather than poetry as a teen. Music was probably the first art form I was seduced by. In fact, it directly led me into reading. Age 14 and I was always to be found outside playing sport, rather than inside reading a book. It was only when an older cousin of mine suggested I could rank cool points at school by listening to The Cure's "Killing An Arab", but he also added I might read Albert Camus' short novel "L'Etranger" ("The Outsider") which it was based on. I did both and have never looked back. I not only read books, I write them too! Music always plays a part in writing my books. I choose a soundtrack of music that relates to the subject matter and then play it solely while I am writing the first draft. It helps set the tone and the rhythm of the book, so that after every break in writing it for food or sleep, I hit 'play' and am instantly conducted back into the mood of the book. For my novel "A,B&E" I put together a soundtrack of Rebetika (The Greek Blues) and club dance music as befit that novel set in a Club 18-30 resort in Greece. 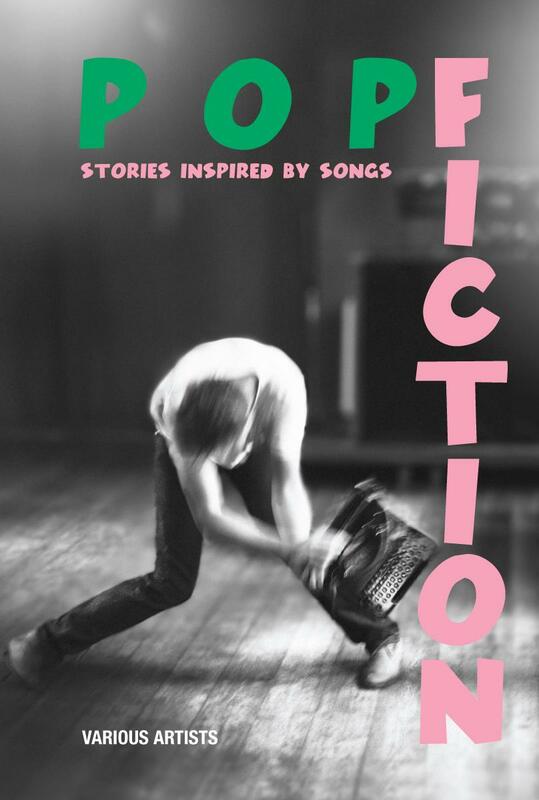 I contributed to an anthology called "Pop Fiction - Stories Inspired By Songs" (see above image) and also wrote the introduction. Literature is perhaps regarded as the highest, noblest art form for opening our minds towards contemplation of the world around us. And rock'n'roll, bubble-gum three-minute-pop about puppy love and teenage crushes, is regarded in some quarters as the most disposable of art forms. Books occasionally percolate society's collective consciousness, for example the obscenity trials over Lady Chatterley's Lover or Last Exit To Brooklyn. Pop frequently outrages, from Elvis The Pelvis, through ‘God Save The Queen’ to Beastie Boys. Yet, despite being from fairly opposite ends of art's 'brow' spectrum, the two are fundamentally intertwined and mutually inform one another. Of course, it goes the other way too. Poets Linton Kwesi Johnson, Benjamin Zephaniah and John Cooper-Clarke have all performed live with backing bands. Gus Van Sant has set texts by William S Burroughs to music, and Steve Fisk composed music for the late Steven Jesse Bernstein's poetry. Then there are the crossover artists: Patti Smith, Nick Cave and Henry Rollins to name but three with a foot firmly planted in both camps. Plus recently we have had short story anthologies inspired by the words of Mark E. Smith and the music of Sonic Youth. Right up to the later drafts, songs were being substituted for those that were in the novel because they were a better fit. Normally when I set up a soundtrack for a novel, all the songs are known to me, or at least I've discovered them as part of putting the playlist together before I've sat down to write word one. But the joy of the writing process for "Time After Time", was that I was discovering new songs WHILE I was writing. That was a wholly new thing for me and this fusion of creative energies of new writing melding with new songs to my ear really helped keep the process fresh for me. When I came to turn the original playscript into a novel text, some of the songs from ten years previous were no longer appropriate or had just dated really badly. I think there were maybe 15-20 songs in my original stageplay, but the greater detail of a novel, of nuanced character gesture and action, meant the final playlist ended up at 45 songs. Enjoy! On the next page is the full track-listing. there's music for almost every genre.